When I think of “Kong Kong” and the 1970s, the terrible “King Kong” remake with Jeff Bridges and Jessica Lange comes to mind. Oh my, how far the Eighth Wonder of the World has come. A completely different take on the legendary screen icon King Kong, “Kong: Skull Island” is an exquisitely photographed, superbly thrilling wartime action-adventure. Set in the aftermath of Vietnam, the film finds a group of adventurers and soldiers ready to explore an uncharted island and are completely unaware of the horrors that await them. The film is filled with suspenseful action set pieces, interesting characters, an unabashed sense of fun throughout, and is a darling tribute to 1970s action adventure cinema. Can it be said enough how much I adore the look of this film? It's so beautifully photographed by DP Larry Fong that I just wanted to lick the screen. The film proves that this guy can shot a film that isn't drenched in grays and blacks (he shot “Watchmen” and “Batman v. Superman:Dawn of Justice"). The film has a stark color palate that evokes the time period in which the film takes place: the early 1970s. The movie finds the mysterious Bill Randa (John Goodman) trying to get funding for an expedition to a mysterious uncharted island in the Pacific. The island is surrounded by raging storm clouds and has somehow miraculous preserved the land in a prehistoric state. A large group head to the island including a team of soldiers led by Prestan Packard (Samual L. Jackson), adventurer James Conrad (Tom Hiddleston), wartime photographer Mason Weaver (Brie Larson), among many others. Before the group and its fleet of military helicopters even have a chance to land, a familiar giant ape rips most of them out of the sky leaving a handful of survivors whose goal is to now just to get off the island. Kong isn't the only beast on the island. There are plenty of other large, exotic, and deadly creatures that take out the rest of the group one by one. 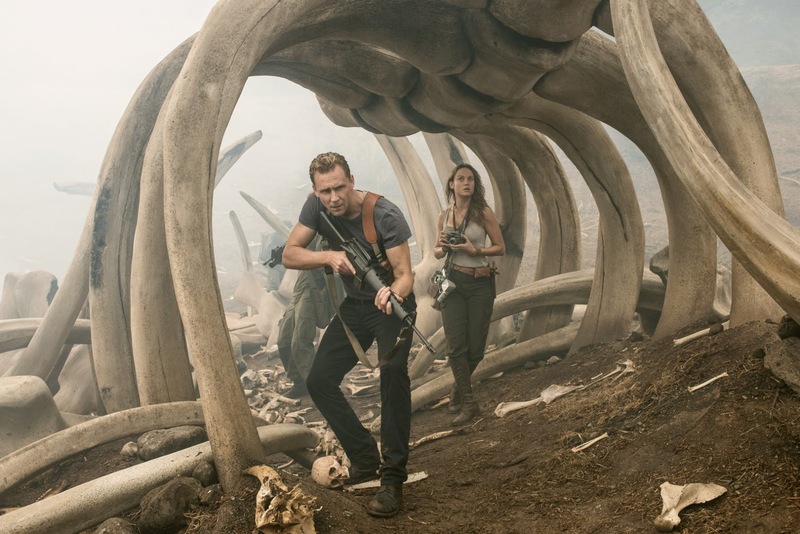 In this way, “Kong: Skull Island” works in the vein of many other fun adventure films, like “Jurassic Park” (and the recent and excellent “Godzilla”) in which humans try to survive among large predators hellbent of making them their next meal. There's not much in the way of fascinating plot; this after all a fun monster movie, but the script provided by Dan Gilroy, Max Borenstein, and Derek Connolly, is completely adequate. They create some fun characters and with director Jordan Vogt-Roberts stage some delightfully thrilling action sequences and a surprising amount of fun, comic relief. Much will be said about this new take on Kong, as it completely differs from the wonderful 2005 version by Peter Jackson. That was a straight up remake of the 1933 classic. “Kong: Skull Island” is very much its own thing. There are recognizable elements including the previously mentioned prehistoric creatures and, of course, a giant man-made wall. The film interestingly set in the aftermath of Vietnam makes for a fascinating setting and Vogt-Roberts gives the film an appropriate look for the time period. Classic rock songs blare on the soundtrack and the visual elements involved are simply scrumptious. And while the film isn't nearly as emotionally wrenching as Jackson's film, the film does find a sweet spot between action and emotion.